The pretty village of Kandersteg sits in the heart of the Bernese Oberland, where the great arc of the Alps culminates in some of its highest and most spectacular peaks. Awe-inspiring and dramatic, the area epitomises the 'chocolate-box' Alps: lush green pastures and lowland slopes carpeted bright with wildflowers against a backdrop of rugged mountains - all topped off with sun-glistening glaciers. A stay here uncovers the very best of the region: the stunning Oeschinensee mountain lake enclosed by towering cliffs; the hidden Gasterntal Valley with its glacial meltwaters thundering down a narrow gorge, and an Alpine pass that has been used since Celtic times. Did we mention the spectacular views? One moment you will be spellbound by the glacial legacy, whilst in another it will be the cobalt blue of the Oeschinensee that will take your breath away. Woodlands, pine forest and open meadows are decorated with lady slippers, fire lilies and more than 25 varieties of scented orchid, where you walk to the the tuneful ringing of cowbells. With the company of the occasional swooping eagle, it is easy to feel on top of the world. Amazingly, all this is accessible on well-defined paths directly from the hotel or after a short bus or cable car ride. 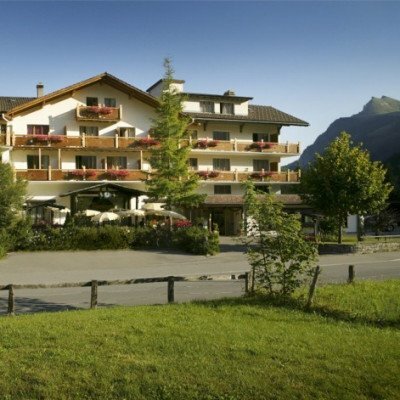 On arrival at the *** Hotel Alfa Soleil, your hosts, the charming Seiler family, will provide you with a Regional Travel Pass giving you unlimited use of cable cars and the local bus service. They'll also ensure you receive a full introduction to the area, including insider tips on where to spot the best alpine flowers! When you feel like a rest from walking, there's an elegant lounge, swimming pool, sauna, solarium and gym to keep you entertained. In the evening you can relax and enjoy regional dishes and fine wines in Nico's restaurant. The walking is of moderate difficulty and includes mountain walking on good (though sometimes narrow) paths with occasional steepish climbs. NB: Some gondolas/cable cars do not operate in early/late season when alternative walks will be proposed. You arrive in time to settle in and perhaps enjoy an aperitif before dinner. This easy-going walk begins with a spectacular cable car ride (included) up to the Allmenalp, a colourful meadow brimming with rural mountain charm. There are stunning views across the valley to towering cliffs, snow-capped peaks and glaciers. Continue into the pastures of the Alpbach, sheltered by a colossal mountain bowl where marmots 'cohabit' with farmers and their cattle. An afternoon descent of the Alpbach Gorge takes you down to the valley floor for a relaxed stroll along the River Kander to the hotel. You begin the day with an exhilarating 20-minute minibus ride (fare included) along a narrow road carved out of the rock wall. The UNESCO-recognised Gasterntal is Kandersteg's 'hidden valley', with snow-fed waterfalls splashing down sheer cliff faces. After an optional, loop-extension further up the valley, you meander down the River Kander, through woods and open meadows to the Waldhaus Nature Reserve - look out for lady slippers, fire lilies and more than 25 varieties of orchid. With the mighty rock walls of the Balmhorn, Tatlishore and the Atels towering high, follow the spectacular Klus Gorge where glacial meltwater rushes down over thunderous waterfalls. Widely regarded as the jewel in the crown of the Bernese Oberland, Oeschinensee is one of the most beautiful Alpine lakes in Switzerland. After a short ride up on the gondola lift (included), follow a marvellous mountain path up to the Heuberg Viewpoint and picnic spot. The cobalt blue water of the lake, surrounded by the snow-capped, razor-edged peaks of the Doldenhorn (3,638m) and the Bluemlisalphorn (3,663m) towering 2,000m above, will be a lasting memory. Call in at the mountain chalets at Obberbargli and Underbargli for refreshments and soak up this unforgettable scenery as bell-toting cows munch at the grass in the pastures below, while dainty waterfalls trickle down from the Frunden Glacier. A gentle hour's stroll takes you down to the Natural Park of Blausee - the Blue Lake (free entry with pass provided). Here you can wander through verdant woodland around the little lake, visit the organic trout farm and enjoy a drink on the lake terrace. Cross the valley at Kandergrund and pick up the Nordrampe Bahnwanderweg - a fabulous walking trail that in part follows the impressive railway as it makes huge loops and swirls through tunnels along the side of the mountain. Enjoy panoramic picnic spots and great views up and down the valley as you stroll past the evocative ruins of the Felsenburg tower. Hillside pastures and shady forest then leads you back to your hotel. If you'd prefer a slightly longer holiday, take a look at our 7 night Classic Swiss Alps Walk. The Hotel Alfa Soleil is a traditional, cosy and family-run hotel on the edge of the village (only 5 minutes' walk from the centre) with a wonderful view over fields to the mountains behind. There are 35 rooms on three floors; all rooms are en-suite and have a television, telephone and hairdryer. For the evenings, the hotel has a cosy lounge bar with a pool table and music desk which is open to both hotel guests and the general public. There is also a large lounge area for residents with an open fire where you can relax for a quiet chat or with a book, or to play one of the hotel's board games. Room upgrades: Superior Double with Balcony, Junior Suite or Suite. Junior suites have a seating area and balcony. The recently refurbished Suites have two rooms - bedroom and living room with south facing balcony. Transfers included from Kandersteg train station at 16:41, and back to Kandersteg train station at 10:00. Sundays from 26th May 2019 to 6th Oct 2019, for 5 nights. All dates are subject to availability, please contact us to check. You should allow £20pp for the train journey at the start of day 7.